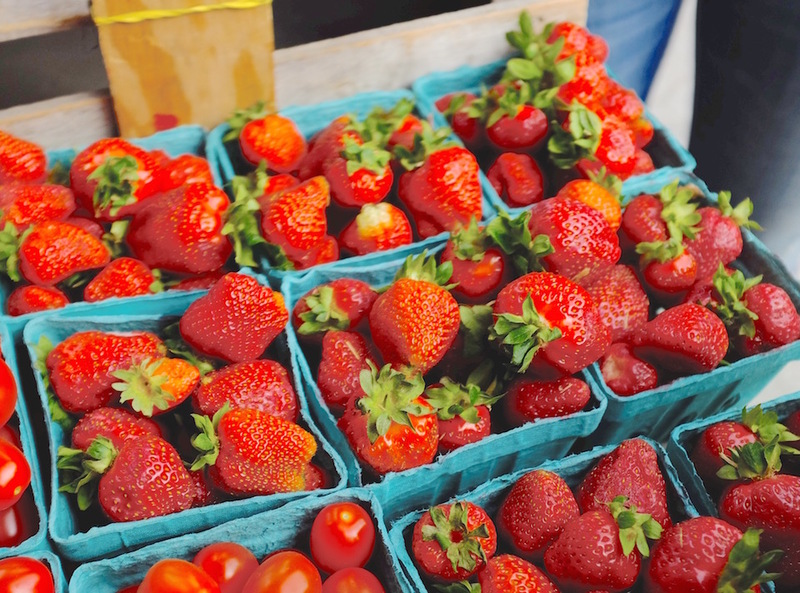 Spring is full of harbingers, but none is more evocative of summer than the first great strawberries at market in late May or early June. As a child, I liked to think that my father had planted the rows and rows of them in our garden with special affection, knowing them to be my favorite fruit. (I would have had him plant strawberry fields forever, if the song had then existed.) The ground around the plants was covered with straw so that each precious berry, after soaking up the vast amount of sunshine needed to ripen it, had its own cradle in which to fall, and therefore would need little or no washing. Papa grew two or three varieties with different ripening times to make the season last as long as possible. Those small- to- medium sized berries were moist and sweet and seductive. Alongside them, some of the big, red, photogenic California supermarket hybrids have as much claim to the name strawberry as today’s steroid-enhanced athletes have to the mantle of Babe Ruth. Not surprisingly, ersatz strawberries have the same sort of nondescript taste and texture one finds in supermarket tomatoes: just enough to be discernible as the thing it’s called, but ultimately only a taunt. They are over-refrigerated and served very cold—death for the flavor of most fruits. Strawberries are versatile, so I try to observe the principle of faire simple (keep it simple), which should always be observed in preparing them. Shortcake can be delicious, but why overwhelm the taste of really good fruit? My favorite way to serve strawberries is sliced in a pretty dish with a tablespoon of mascarpone, crème fraîche, plain yogurt, fresh ricotta, whipped cream, or vanilla ice cream. A bit of freshly ground pepper can really pull the fruit and dairy flavors together, and today one can play with the huge variety of peppercorns. For more elaborate desserts, I mostly avoid preparations like meringues that are heavy on sugar. As a rule, one should enjoy natural sweetness, and with good strawberries that’s what you’ll get. In Italy, great strawberries are served with just a squeeze of lemon, or sometimes a dash of fine aged balsamic vinegar. On the other hand, a nice tarte sablèe covered with strawberries and a thin glaze of strawberry coulis is a platonically perfect confection—but I think of that more as a special treat than as the end of a meal. Desserts should be only as sweet as they need to be to cleanse the palate following the last savory course. The sweetness of good strawberries can be channeled to help other fruits. I like to add a cup of strawberries a few minutes before I’m done making my rather acidic rhubarb compote. This I serve with yogurt or fresh ricotta, or with fromage blanc, a common marriage in French bistros during strawberry season. For a further variation aux fraises, this on the sweeter side, try mixing a few fresh sliced strawberries with raspberries and serving them with a panna cotta or a custard: it’s a nice contrast of textures, and though you’re adding a bit of sweetness, you’re still nowhere near the sugar surge of a strawberry shortcake. Two French Health Secrets? Water and Walking.